Currently, I would guess I have well over a thousand recipes saved, just waiting for me to try them out. It’s a bit overwhelming when there are so many great recipes and so little time. I try to prioritize, plan ahead, and try what’s in season. Things get a little backlogged, and this recipe has been saved since I received the March 2013 issue of Southern Living. 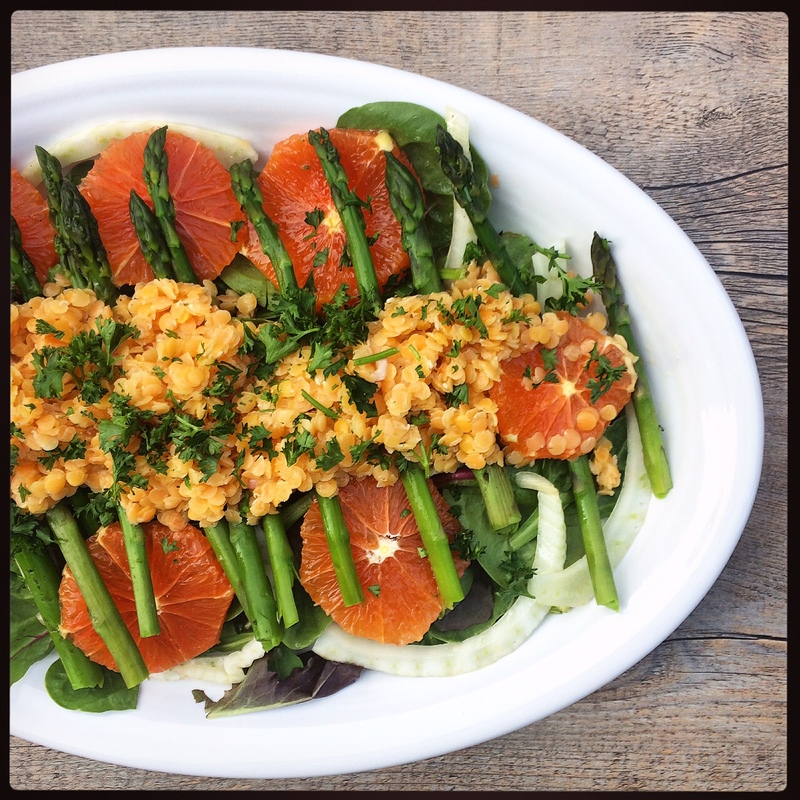 The combination of fennel, oranges, asparagus, and beautiful pink lentils was really intriguing to me. End result: I’ve made this salad twice since Easter and can’t get enough. It’s one of those salads that keeps well for lunches the next day, which is a rare occurrence in the world of Salads. This salad is easily adaptable, I used white wine vinegar instead of champagne vinegar. You can tweak the amount of fennel, greens, and lentils you use depending on the kind of salad you are going for. Hate fennel? Leave it out! You might want to make a little extra dressing for serving, I always eyeball my salad dressings. 1. Make the Shallot Vinaigrette: Whisk together vinegar, shallots, honey, Dijon mustard, kosher salt, and freshly ground pepper in a small bowl. Gradually whisk in olive oil until blended. 2. Rinse fennel thoroughly. Trim and discard root end of bulb. Trim stalks from bulb, and chop fronds to equal 1/4 cup; reserve stalks and remaining fronds for another use. Thinly slice bulb, and toss with oranges, pepper, 1/2 tsp. salt, and about 1 tablespoon of the vinaigrette. Cover and let stand until ready to use. 2. Meanwhile, cut asparagus tips into 1 1/2-inch pieces. Cut stalks diagonally into thin slices, discarding tough ends. 3. Bring 3 cups water and 1/2 tsp. salt to a boil in a large saucepan over medium-high heat. Add asparagus, and cook 1 to 2 minutes or until crisp-tender; drain. Plunge into ice water to stop the cooking process; drain. Pat dry with paper towels. 4. Bring 3 cups water and remaining 1/2 tsp. salt to a boil in saucepan over medium heat. Add lentils; return to a boil. Reduce heat to low, and cook, stirring often, 8 to 10 minutes or until crisp-tender. Drain well, and rinse with cold water. Toss lentils with 1/4 cup Champagne-Shallot Vinaigrette. 5. Combine lettuces, parsley, asparagus, fennel mixture, and fennel fronds in a large bowl; toss with remaining vinaigrette. Spoon lentils onto a serving platter; top with asparagus mixture.